A tribute to the grand-Olds American car  In My Merry Oldsmobile, on a rare 3-minute wax record, sung by the great pair Arthur Collins & Byron G. Harlan. Announcement "In My Merry Oldsmobile, by Collins & Harlan." Ransom Eli Olds produced his first motorized carriage in 1897. The end of the Oldsmobile line came April 29, 2004. Enjoy this great Gus Edwards waltz song, in honor of the eponymous gas machine, sung by the top recording duo of this period at their finest: Collins and Harlan. The recording is announced by Collins. See the July 1999 Cylinder of Month for another famous Gus Edwards song. 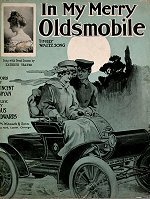 Although double-meanings in lyrics was nothing new  even in 1905  still, listeners would be relieved to learn that after all their adventures in the Oldsmobile, young Johnnie Steele eventually did marry Lucile. "Down the road of life we'll fly  automobubbling you and I." This was recorded on a then new style wax record: at a full 50% longer than standard cylinders (see photo, below), the Columbia Phonograph Company's 6-inch "Twentieth Century" records could hold a nearly 3½ minute recording. Similar to the failed and unwieldy 5" diameter "Concert" cylinders (produced 1898-1905), Twentieth Century records required a special phonograph to accommodate the bigger cylinders. First released in July 1905, this early attempt at a longer-playing cylinder was soon overshadowed by the more convenient standard-sized 4-minute wax record in 1908. At any rate, during its short 3-year run, customers could enjoy an extra verse, chorus, or both, of their favorite songs. These differing cylinder formats, however, seemed mainly to increase consumer uncertainty in the long-term commercial prospects of the cylinder record  and the disc record was already on its way in overtaking the cylinder. 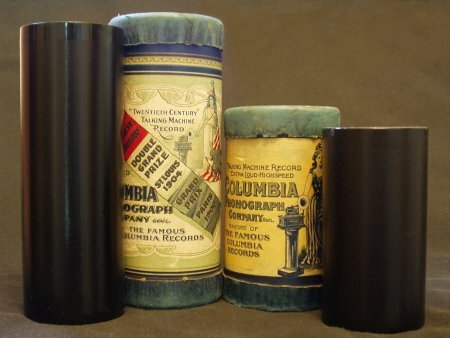 Comparison of a Columbia 6" Twentieth Century three-minute and a standard 4" two-minute wax cylinder. The History of the Oldsmobile, courtesy of GM's Oldsmobile site.